Welcome back to the Arne Wellness Center blog. In parts one and two of this short blog series, we began looking at the common symptoms associated with Lyme Disease, an infectious disease which is transmitted to humans and animals through ticks carrying the bacterium known as Borrelia burgdorferi. 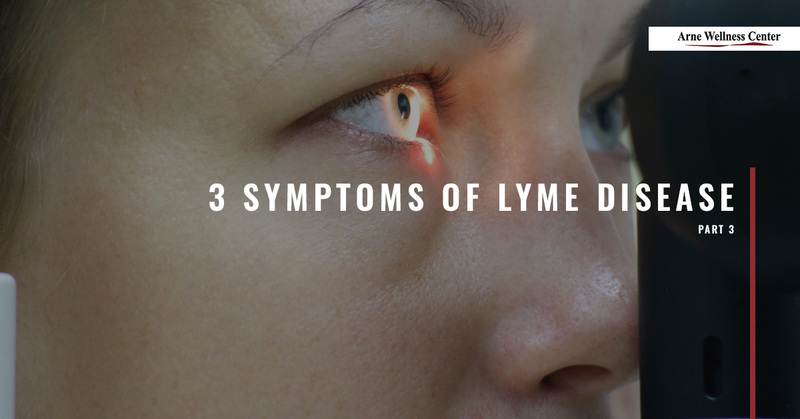 Lyme Disease is a common infection that affects many Coloradoans and in today’s post, we will continue looking at the most common symptoms of this disease. For some who suffer from Lyme Disease, neurological disorders may be present, including that of Bell’s Palsy. This is when the disease affects the facial nerves, causing sudden weakness or decreased muscle tone of the facial muscles, which causes one side (in some cases both sides) of the face and the eyelid to droop. This nerve weakness may make it difficult to smile, frown, wink, and even chew in some cases. Along with facial drooping, a patient may experience numbness and tingling, double vision, blurred vision, dizziness, and even changes in hearing. Some patients who suffer from Lyme Disease may experience eye irritation as a result of inflammation. Along with the swelling, some patients also report red, sore eyes and may even experience blurred or double vision as a result. While this symptom can be mistaken for eye allergies which affect a large portion of Littleton’s population, this symptom should not be ignored, especially if it is ongoing or manifests in conjunction with any of the other symptoms we’ve discussed. Fatigue and exhaustion commonly occur within the first few days to the first month after becoming infected. Like eye inflammation, this is also a symptom that occurs with the flu or other serious flu-like infections; however, for those with Lyme Disease, the effects of fatigue can be quite dramatic. In fact, many patients may need to take one or more naps during the day as a result, which can significantly affect their ability to perform day-to-day tasks and activities, and may even become dangerous when driving or operating equipment. If you or a loved one displays any of these symptoms, especially after being bitten by a tick, please come see our chiropractor here in Littleton or refer your loved one for a consultation with us. Starting Lyme Disease treatment at Arne Wellness Center early on may reduce the onset of the more severe symptoms, which we will continue discussing in the conclusion of this blog series.